Object storage is a popular and scalable method of storing and serving static assets such as audio, images, text, PDFs, and other types of unstructured data. Cloud providers offer object storage in addition to traditional local or block storage, which is used to store dynamic application files and databases. Read Object Storage vs. Block Storage to learn about the use cases and differences between the two. Spaces is a simple object storage service offered by DigitalOcean. In addition to being able to login and upload, manage, and delete stored files through a control panel, you can also access your DigitalOcean Space through the command line and the Spaces API. 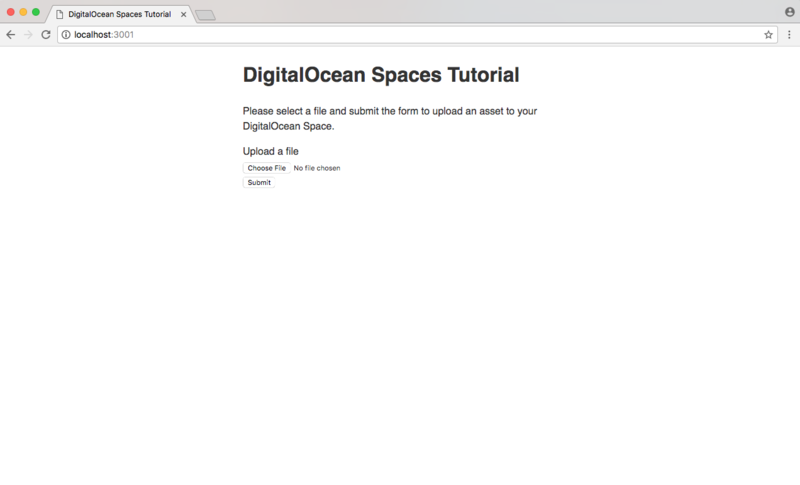 In this tutorial, we will create a Node.js application that allows a user to upload a file to their DigitalOcean Space by submitting a form on the front-end of a website. A DigitalOcean Space, along with an access key and secret access key to your account. Read How To Create a DigitalOcean Space and API Key to get up and running with a DigitalOcean account, create a Space, and set up an API key and secret. Node.js and npm installed on your computer. You can visit the Node.js Downloads to install the correct version for your operating system. You should now have a DigitalOcean account, a Space with access key, and Node.js and npm installed on your computer. The first step is to create a credentials file, to place the access key and secret access key you obtained when you created your DigitalOcean Space. The file will be located at ~/.aws/credentials on Mac and Linux, or C:\Users\USERNAME\.aws\credentials on Windows. If you have previously saved AWS credentials, you can read about keeping multiple sets of credentials for further guidance. Open your command prompt, make sure you're in your Users directory, have access to an administrative sudo user, and create the .aws directory with the credentials file inside. Open the file, and paste the following code inside, replacing your_access_key and your_secret_key with your respective keys. Now your access to Spaces via the AWS SDK will be authenticated, and we can move on to creating the application. To begin, create a directory in which you would like to place your Node.js application and navigate to the directory. For this demonstration, we will create our project in spaces-node-app in the sites directory. Create a new package.json file for your project. Paste the code below into the file. This is a basic package.json file listing the name, version number, and license of our application. The scripts field will allow us to run a Node.js server by typing npm start instead of node server.js. We will install all of our dependencies with the npm install command, followed by the names of the four dependencies in our project. After running this command, the package.json file should be updated. These dependencies will aid us in connecting to the DigitalOcean Spaces API, creating a web server, and handling file uploads. express — Express is a web framework that will allow us to quickly and efficiently set up a server. multer — Multer is middleware that will handle file uploads. multer-s3 — Multer S3 extends file uploads to S3 object storage, and in our case, DigitalOcean Spaces. Now that we have our project location and dependencies set up, we can set up the server and front-end views. Note: npm install saves dependencies to the package.json file by default in current versions of Node. If you are running an older version of Node, you will have to add the --save flag to your npm install command to ensure that package.json gets updated. First, let's create files for the public views of our application. This is what the user will see on the front end. Create a public directory in your project, with index.html, success.html, and error.html. All three of these files will have the below HTML skeleton, with different contents in the body. Write the following code into each file. Write an error message in the body of error.html. Write a success message in the body of success.html. In index.html, we will create an HTML form with multipart/form-data. It will consist of a simple file upload input and a submit button. Finally, let's create style.css and add just enough CSS to make the application easy to read. With these three files, we have an upload form which makes up the main page of our small application, and we have success and error pages for the user. We've created all the files for the front end of our application, but we currently don't have a server set up or any way to view them. We will set up a Node server with the Express web framework. In the root directory of the project, create a server.js file. At the top, load in our four dependencies with require(). We will route our application through the app instance of express. Our front end is located in the public directory, so set that configuration below the dependencies. We will route index.html, success.html, and error.html relative to the root of the server. Finally, we will tell the server which port to listen on. In this example, 3001 is used, but you can set it to any available port. Save server.js and start the server. You can do this by running node server.js, or with npm start, the shortcut we set in package.json. Navigate to http://localhost:3001, and you will see the upload form, since we set index.html to be the root of the server. You can also navigate to http://localhost:3001/success and http://localhost:3001/error to ensure those pages are routing properly. Now that we have our server environment up and running properly, the last step is to integrate the form with Multer and Multer S3 to make a file upload to Spaces. You can use new aws.S3() to connect to the Amazon S3 client. For use with DigitalOcean Spaces, we'll need to set a new endpoint to ensure it uploads to the correct location. At the time of writing, nyc3 is the only region available for Spaces. In server.js, scroll back up to the top and paste the following code below the constant declarations. Using the example from the multer-s3 documentation, we will create an upload function, setting the bucket property to your unique Space name. Setting acl to public-read will ensure our file is accessible to the public; leaving this blank will default to private, making the files inaccessible from the web. 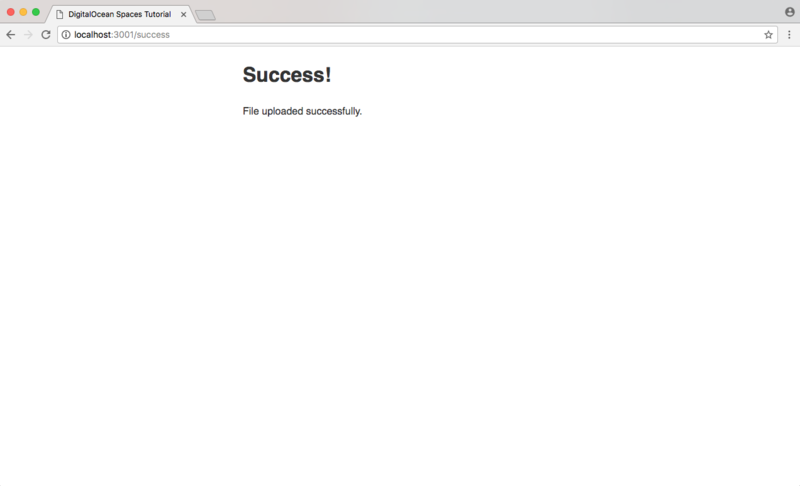 The upload function is complete, and our last step is to connect the upload form with code to send the file through and route the user accordingly. Scroll to the bottom of server.js, and paste this code right above the app.listen() method at the end of the file. When the user clicks submit, a POST request goes through to /upload. Node is listening for this POST, and calls the upload() function. If an error is found, the conditional statement will redirect the user to the /error page. If it went through successfully, the user will be redirected to the /success page, and the file will be uploaded to your Space. Here is the entire code for server.js. Stop the Node server by typing CONTROL + C in the command prompt, and restart it to ensure the new changes are applied. Navigate to the root of the project, select a file, and submit the form. If everything was set up properly, you will be redirected to the success page, and a public file will be available on your DigitalOcean Space. Assuming the file you uploaded was test.txt, the URL of the file will be https://your-space-here.nyc3.digitaloceanspaces.com/test.txt. Common reasons for an unsuccessful transaction would be wrong credentials, credentials file in the wrong location, or an incorrect bucket name. Congratulations, you've set up a Node.js and Express application to upload static assets to object storage! You can play around with the code of this DigitalOcean Spaces Node App by remixing the project here. Additional precautions such as authentication must be taken to put this type of application into production, but this is a good starting point to make your web app functional with DigitalOcean Spaces. For more information about object storage, read An Introduction to DigitalOcean Spaces.